WMSPanel team is pleased to announce new product for Android mobile platform, called Mobile broadcasting SDK. At the moment, our WMSPanel service processes data from thousands of different media servers those are doing hundreds of thousands of streams and our Nimble Streamer media server handles billions of connections monthly. We experience a constantly growing demand for new features from our customers who are interested in mobile streaming solutions. Mobile streaming share increases rapidly, because modern devices are able to provide pretty high quality video and audio content, and, what is important, are broadly used. However, building just streaming application isn't main objective. What really comes to the fore is ability to apply company's business logic to mobile streaming within existing infrastructure or build such infrastructure in easy and common way. For example, one important concern is security and legality of content delivered from mobile. First of all, streaming application should be able to perform authentication to media servers receiving and processing stream. After the stream is processed and distributed, it can also be important to protect resulting streams from hot-linking. On the other hand, streaming infrastructure should be able to block specific application instance from publishing to media servers in case delivered content is considered offensive or conflicts with company's policies. Next concern is video distribution across available platforms and devices. Then media servers control and reporting. And there is more to come. So, SDK is not a standalone streaming library, it's intended to be a part of complex streaming solution, provided by WMSPanel. WMSPanel statistics and media server management. It is cloud-based streaming control and reporting service. Nimble Streamer. Fast and powerful streaming server application. According to official reports, only registered Nimble Streamers process billions of connections each month and this number is constantly increasing. Dispersa. Distributed streams availability verification system. Currently, it processes several thousands of streams. Paywall streaming protection and monetization framework. 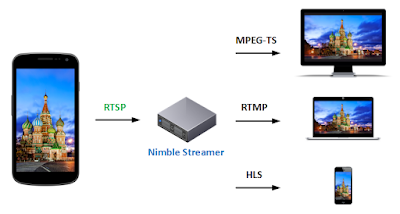 Mobile broadcasting library provides necessary API for broadcasting live video and audio content from mobile device to a media server, which supports RTSP publishing of interleaved H.264/AAC stream over TCP. Basic and Digest RTSP authentication methods are supported and used depending on capabilities of target media server. SDK was successfully tested with Nimble Streamer, Wowza Streaming Engine and several online services. Minimum supported Android version is 4.1 (Jelly Bean). Video and audio encoding is performed via Android camera API. Video is encoded in H.264, audio is encoded in AAC format. All streaming related processing is performed via streaming library. The library is accompanied by Larix Broadcaster application for Android, which basically consists of stream preview dialog and dialog for setting encoding and streaming parameters. The application is capable of publishing live video and audio to specified RTSP URL. Mobile broadcasting SDK is a proprietary software and it is distributed per subscription model. Once you make a subscription, you receive a full-time support and all of our updates with new features and enhancements.